Don’t throw out that old, dated piece! Why not consider upcycling it? What is Upcycling? It’s the buzz word in the industry for eco-friendly decorating. Taking an item that is no longer needed or wanted and giving it new life as something that is useful or creative. I know you are probably thinking – you don’t have the vision or talent but I am here to tell you that you do! It’s not as scary as it sounds. Upcycling inspiration is all around you and you probably don’t even realize it. Take a look around your home and find that one piece that you are tired of, wanted to give away – that’s where you can begin your Upcycling journey! Need some more ideas? Pinterest.com always has great examples you can use for your inspiration. 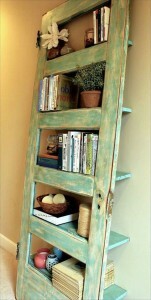 You can use an old door and give it new life as a unique leaning shelf. Cut out the panels, hinge each shelf & ensure the shelf is stable to hold your favorite treasures. A little paint here and there and added lacquer, sanding or staining to suit your desired look and voila – a new piece that you adore! 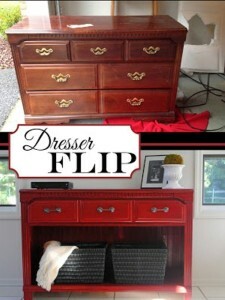 Here’s another easy project you can do: take an old dresser – give it new life with paint, change out the handles, remove some drawers, add some wicker baskets and you now have a new fabulous piece that looks incredible and you transformed it yourself! Have some old oil cans around? 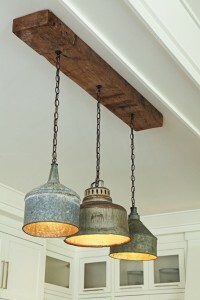 Why not upcycle them into pendant lights? They are right on trend! Most of all it is FUN! Anyone can Upcycle – the college student short on cash, homeowners who are looking at ways to update their home, the mom on a budget – even children! I invite you to join the Upcycling craze and see what amazing transformations you can create. Once you begin I know you will be hooked! 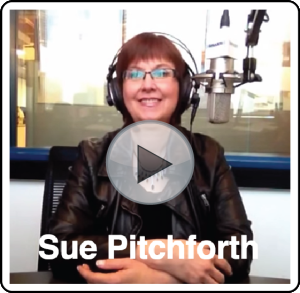 Watch and listen as @SuePitchforth talks about creating an outdoor room that won’t break the bank, on WhatSheSaid!